Middle-aged American Eric Holloway was thinking that it must be almost time for the miracle to happen again. He sat in a camping chair near the section of the shore of Loch Lomond facing Ben Lomond, one of the lochs someone wrote a song about, while chewing a mouthful of his onion bagel smothered in lox and cream cheese. Mark’s Deli in nearby Glasgow certainly lived up to its Yelp reviews. He was glad they opened early on a Sunday so he’d have the time to eat his breakfast. The retired electrical engineer would have hated to be reduced to the one he’d visited last Friday in the mall, and he only went there because he had to buy some fresh clothes Barry’s size and a small pack to put them in. As he continued to maul his exquisite deli purchase, Eric used his free hand to wave away several locks of his salt and pepper hair off of his forehead. He always neglected getting a haircut until his mane became unmanageable. The weather forecast called for morning showers and temperatures in the upper 30s F, but so far he could still see thin rays of sunlight through the overcast sky. Putting the half-consumed bagel on the napkin gracing his lap, and without looking down, he retrieved his thermos from on top of the grass to this right next to his rucksack. Unscrewing the lid and stopper, he poured himself a cup of streaming, hot coffee. It, along with his thick, woolen pea coat, would keep him warm on this morning in late December, just two days before Christmas, while he waited. Finishing the coffee, he screwed the lid back on top of the thermos, and as he picked up the bagel again, he felt the Lazarus Stone begin to heat up in his shirt pocket. “About damn time.” Putting his meal down again, he unbuttoned the top of his coat, and reaching in, pulled the silver-dollar sized flat rock out. Holding it in the palm of his hand, it glowed slightly green, feeling as warm as the fur of his cat Felix back home in Port St. Lucie. He stood up on the uneven ground, placed the bagel on his chair, and walked a few steps forward. Then he saw the disturbance in the loch several hundred meters off shore. The surface of the water was rippling. As it got closer, he smiled and gripped the rock tighter. It was almost too hot to hold now, but the ritual required that he not let go until the victim could breathe again. He might have started out by swimming, but now Barry was walking as his head emerged first, and then his shoulders and torso. The seventeen-year-old’s dark hair was dripping as it hung low over his forehead and ears, and his pale green eyes looked glassy. Barry hastily pulled off his drenched t-shirt and swimming trunks, grabbed the towel out of the proffered pack, and rubbed himself down. The older man had to quickly retrieve his meal from the chair as the youth sat down to pull on his pants. In a few minutes, after Eric had bolted down the remains of his meal, Barry was huddled in a jacket and consuming his first warm drink since last July. “Beginning?” Eric laughed as he looked down at the befuddled and annoyed Barry who wasn’t quite himself yet. “You’re the one who told me about the curse. Perpetual youth and immortality, but only if accompanied by the curse of dying at irregular and unpredictable intervals.” As an afterthought, he pulled the Lazarus Stone back out. “Yeah, it’s dead as a doornail, and the next one won’t manifest until you die again. Then I’ll have to search for it. “It always happens this way. The partner gets older and starts to think of me as his or her son. You know eventually, I’ll be the one burying you.” His eyes flickered with a hint of sadness and past grief. I put them in bold so the reader could find them in the body of my story. I’ve already written about one immortal today, and as I started typing this story, I was wracking my brain in search for what to create. 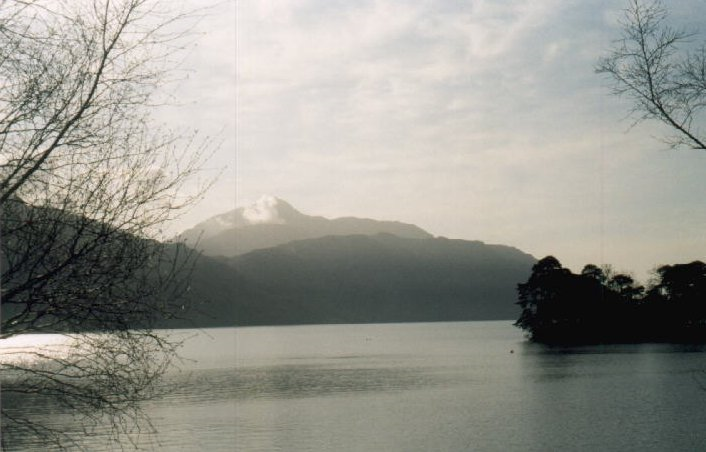 After looking up lochs in Scotland and settling on Loch Lomond, I started with an actual (and really sad) news story of a seventeen-year-old boy who drowned in the loch last July. In real life, the body was recovered, but that wouldn’t work out in my tale. At first, I planned to have the boy’s death be a murder, and Eric was his father and some sort of investigator come to Scotland to solve it. That really didn’t work out for me, especially since he was casually munching on his lox and bagel, so I settled on a form of resurrection, but I needed a way of making it somewhat casual. So it became a repeated event, a person bearing both a blessing and a curse. Down through the ages, he’d need a friend or companion to find the mystical Lazarus Stone (which I adapted from the DC comics concept of the Lazarus Pit), which would manifest somewhere on Earth once “Barry” (only his most recent name) unpredictably died. Fortunately for this immortal, he’s found a way to amass a large fortune so he can attract an honest and reliable partner and enabling that partner from literally sparing no expense in finding the stone. I set the scene to occur tomorrow morning, since a Jewish-run deli would never be open on a Saturday (Shabbos). Also, the forecast for Loch Lomond for tomorrow is for morning showers. Lastly, there really is a Mark’s Deli in Glasgow (only 33 miles from Loch Lomond) and it’s supposed to be really good. Interesting story. Imagine the wealth of information “an immortal” will know. ***That – and centuries of sadness. That’s true, but just how far does human memory go? Would he eventually run out of “space” and start forgetting? Also, dying all the time like that, you’d think eventually he’d just go mad. Nobody ever said that living forever wouldn’t have its own issues. *** Who (really) wants to live forever? I don’t think anyone would, but we don’t want to die, either. Using a vivid imagination and building a great story. Well done.